The reaction is no longer to punish, but to empathize. To be “trauma-informed” is to recognize that 25 percent of children under 17 have suffered some form of trauma in their life, according to the National Child Traumatic Stress Network, and to help them heal and move on rather than punish them for how they have responded to what happened to them. In many towns and cities across the state, New Britain among them, agencies such as the Child Health and Development Institute have implemented programs in schools or mental health facilities such as CMHA through state funding. In addition, the Department of Children and Families (DCF) now takes a trauma-informed approach to all their work including child welfare and juvenile justice, in schools and in health care, said Gary Kleeblatt, DCF spokesman. New Britain’s efforts, however, don’t stop at what the state provides. “The central focus of New Britain seems to be relationships, because programs don’t change people, people change people,” said Nelba Marquez-Greene, founder and executive director of the Ana Grace Project which works within New Britain schools to create a trauma-informed place of learning. Through the long-standing partnerships that exist in the city, in-town resources along with a $2.1 million federal grant are being used to build an informed community and practices that are sustainable to give their residents the best chance at success. “It’s creating a culture and creating an environment in your town where everyone is aware that everybody’s different, aware that everybody has their own things that are going on in their lives or demons that you are hiding or fighting and how to be sensitive to that so that individuals don’t feel that they are boxed out or stuck in a corner or act out like Adam Lanza,” said New Britain Mayor Erin Stewart. Lanza was the troubled young man who took the lives of six faculty members and 20 elementary students — including Maraquez-Green’s daughter, Ana Grace — at Sandy Hook Elementary School. And although trauma-informed work has been in progress for well over a decade in Connecticut, the tragedy at Sandy Hook was the impetus for the impact of trauma to be given more attention. DCF launched the cognitive behavioral intervention for trauma in schools in Bridgeport, the Trauma Coalition was formed in New Haven, Marquez-Green started the Ana Grace Project out of her basement in Newtown and a New Britain elementary school teacher reached out to her and asked for help in his classroom. “I don’t want to get to that point where I have a mom like Nelba who has her 6-year-old daughter murdered and not know where to go or what to do, and knowing that we could have taken steps to prevent it,” Stewart said. Although the tragedy at Sandy Hook did not happen in New Britain, Stewart, Marquez-Greene and others say it could have and it still could if steps are not taken to support the needs of students who are growing up in poverty, in single-parent homes, surrounded by neighborhood violence or who have been physically or emotionally abused at some point in their life. Some of these children may not have someone at home who they can rely on for love and support to help them through traumatic incidents or living situations, said New Britain Superintendent of schools Nancy Sarra. And to truly have a trauma-informed city, that can’t stop when the bell rings at the end of the school day, its advocates say. It needs to include the after-school programs, the medical practices, government offices, law enforcement and even Central Connecticut State University (CCSU). The Coalition for New Britain’s Youth regularly brings together all of these major players in addition to the superintendent, mayor and Marquez-Greene to allow them to work toward a common goal. In this case, changing the culture of the city and implementing resources to realize, recognize and respond to trauma in the hopes that this will give the 75,000 residents, and especially the 10,000 school children, the best chance at success. But working together isn’t new. The partnerships formed within the coalition make it easier for needed services to actually reach children and families and for lack of funding to become a little less of a worry for all. The coalition is able to apply for grants on behalf of dozens of organizations, making it more likely they will receive them and brings in a higher level of funding, Stewart said. “I think having such a solid community of collaboration gives us the ability to focus on these things and be able to lean on our partners for support,” said Ryan Morgan, the project manager hired under the Safe Schools, Healthy Students grant. It doesn’t mean that the various organizations working to recognize and address trauma aren’t in need of funding, Marquez-Greene said. It’s always a worry. But by partnering, organizations can use their resources to fill the gaps of others. “I’m super optimistic that with the number of hands on deck, everybody working with the mayor and the superintendent and CCSU and the Ana Grace Project and all the other partners all working together, that we will be able to come up with something,” Marquez-Greene said. For example, the coalition has brought medical and mental health resources into the schools to treat trauma in a place where kids and families already are at no cost to the district, Sarra said. Up until now, funding for Ana Grace initiatives come from the school budget, the Safe Schools and Healthy Students Grant and private funders, Marquez-Greene said. The federal grant, however, has not been renewed leaving all the school’s initiatives, not just Ana Grace, more tenuous. The Ana Grace Project began in just one classroom in Chamberlain Elementary School in 2013. Since then it has expanded to this year include six schools when classes begin again in September. The goal is to expand it into all New Britain public schools, but the effort is going to be “smart and strategic,” according to Sarra., because “to do it all quickly wouldn’t do well,” by the students. And a big part of doing well for the students and achieving success for New Britain’s families, according to Stewart, is helping children realize that college can be in their future. “I want them to look at CCSU and know that that’s a viable and affordable option,” said Stewart, an alumni of CCSU herself. That begins by getting students and parents onto the CCSU campus, and CCSU students out into the community. With the Ana Grace Project now residing at CCSU, that has become even more possible. In all six schools where the Ana Grace Project is active, interns from CCSU’s graduate social work program are placed to assist the teachers, in-school social workers and the therapists from Klingberg Family Centers. 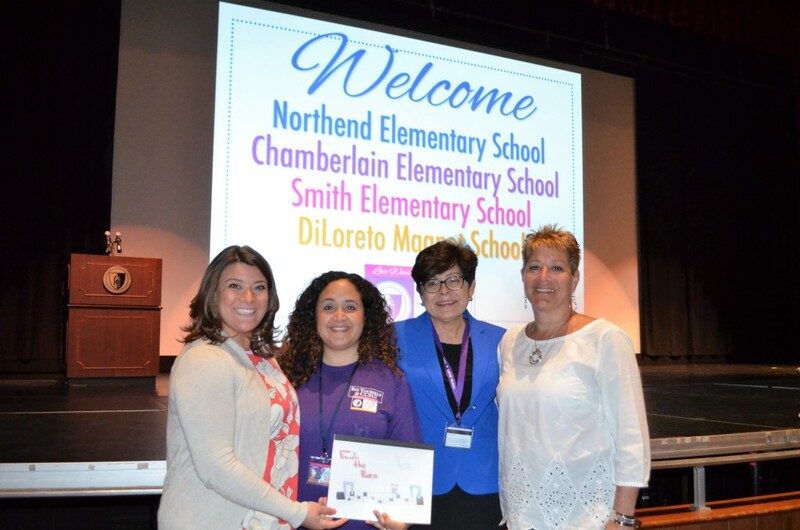 Teachers in New Britain also attend trauma-informed professional development workshops at CCSU and the current education students are being taught in this way so that the next generation of teachers will address trauma from the get-go, said CCSU President Toro. The first year there were just 88 kids. This past year there were over 400 and that number is expected to grow. “One of my passions is to develop the pipeline for underserved students to attend college. As part of that work, more and more I became aware that there were more challenges,” Toro said. But in order to get to college and a career, students need to graduate. And to do that, students need to be in school. And that’s where looking at misconduct as a result of trauma can help. With the use of the restorative practice model New Britain High School was able to reduce out-of-school suspensions and referrals last year by 300, Sarra said. New Britain isn’t the only school district to implement the concept of restorative practice. It has had a great impact on New Haven public schools suspension and expulsion rates as well, said Kim Jewers-Dailley, director of trauma-informed schools through the New Haven Trauma Coalition. However, making this change isn’t always easy. Jewers-Dailley said much of the problem could be that teachers are overwhelmed. But Jewers-Dailley said the supporters outweigh the skeptics. A good teacher “can no longer be just the person standing up front dolling out the assignments. They need to build relationships,” Sarra said. For many children who suffer from trauma, “it can take just one caring adult to save a kid’s life,” Jewers-Dailley said. They just need one person to reach them where they are whether it is a teacher, a provider, a parent, a police officer or a coach. And that’s why New Britain has committed to getting the entire city on board. “If we are going to be successful in having the workforce we need as a country, we need to be informed and be involved in solving all the obstacles and problems students may have that are not allowing them to be successful,” Toro said. This article originally appeared in the CTMirror.